The single bloodiest day of any American war was recorded just up the road from the C&O Canal in Sharpsburg, MD. After a rousing victory at the Battle of Second Manassas in Virginia, General Robert E. Lee was moving north—hoping to increase his army’s momentum and credibility. On the morning of September 17, 1862, his army of 40-50,000 men clashed in a brutal conflict with 90,000 Union soldiers under General George McClellen. By sunset, more than 23,000 men were killed, missing, or wounded. The battle was considered a draw, but it halted Lee’s invasion of the north. 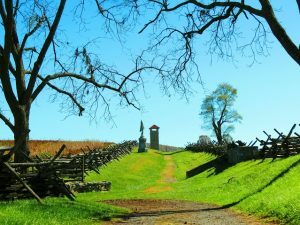 With more than 10,000 acres preserved, Antietam National Battlefield is one of the most pristine Civil War sites in the nation. Operated by the National Park Service, the battlefield offers a visitor center with exhibits and introductory film, self-guided auto tour, self-guided and ranger walks—even a scavenger hunt.